It’s the most wonderful time of the year: Ski season. Gear up for your day on the mountain by practicing these ski exercises to help strengthen the muscles utilized in your favorite winter sport. You can even treat yourself to a nice hot chocolate après-ski workout. Core stabilization: Standing on skis for an extended period of time while flying down a mountain requires core strength to keep your body upright and balanced. A strong core allows your body to utilize energy for the main components of skiing, rather than just staying up. Heavy weights: This helps with not only strength, but also explosive power. Explosiveness: As with many sports, explosiveness is key to performance. While you ski, you are constantly having to change direction and push yourself with poles during flat parts of trails, and the impact from flying down the mountain requires a high amount of explosive power and control. Using a straight bar, secured at the top of the cable machine, stand with feet shoulder-width apart, with a slight lean forward and a slight bend in your knees. In an overhand grip, push the bar down towards your legs, utilizing your lat muscles (think: armpits). Perform 10-15 reps.
Start by lying on your back, with arms and legs fully extended. Then, bring your arms and legs both up to a “V” shape with your body, as if you’re going to touch your hands to your feet for 10-15 reps. After this, hold the extended position with your shoulders and legs off the ground for 15-30 seconds, squeezing your core. With your feet shoulder width apart, sit back as if you’re sitting in a chair and use your legs to push yourself back up. Focus on driving up out of the squat fast and forcefully. Aim for 3-6 reps. For more advice on executing the barbell squat, check out this guide. Using a yoga ball, start in a plank position with your forearms on the ball. 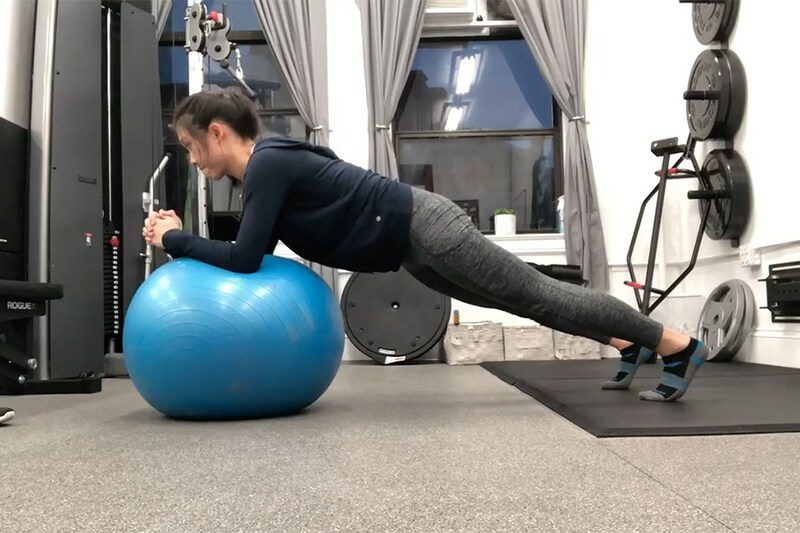 Slowly circle your forearms in a clockwise motion while staying balanced on the ball and maintaining minimal movement in your hips (a wider stance helps). Switch to a counter-clockwise motion for 10-15 reps. While facing the box, explode up from the ground and softly land on the box with one foot. Focus on driving your knees up during your jump. Box jumps are 90 percent mental, so tell yourself that you will clear the box. Aim for 10-15 reps on each leg. Did you try these ski exercises out? Tag us at @bewellboston and @ChristinaYChu on Instagram to share your workout!